My class is just finishing up and then I am free. Mountinburd is coming up and we have 4 days of hard hunting. Good luck guys maybe theres an upgrade out there. Best of luck guys!! Go schwack some bigguns!!! Tell us the story. Hope it has a happy ending. Well no kills boys. It was a tough 5 days and I think I lost about 8 pounds. Many many miles were put on with very little action. The only really good weather day was Tuesday and this morning before it warmed up. I managed to bump into a bird running and gunning Tuesday that I called into 15 yards, but I just couldn't get a shot. He then circled around my weak side and he busted me trying to shift. It was a fun hearing him spitting and drumming and just hammering gobbles that close. Wildspur got into some birds as well but no kills. He saw 4 bears as well. Beautiful country there. I think I'm headed back up Memorial day weekend to visit my family, so I should be able to sneak out for one or 2 more hunts. It kills me to put the gear and clothes away for the year. Just kills me. I managed to bump into a bird running and gunning Tuesday that I called into 15 yards, but I just couldn't get a shot. He then circled around my weak side and he busted me trying to shift. It was a fun hearing him spitting and drumming and just hammering gobbles that close. I think I'm headed back up Memorial day weekend to visit my family, so I should be able to sneak out for one or 2 more hunts. Dang it man!!! 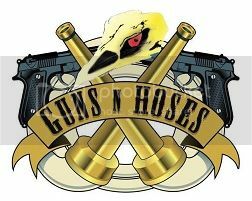 Tough year for Guns N' Hoses. Well, at least you aren't eating tag soup like some of us. Good luck on the last hunt.